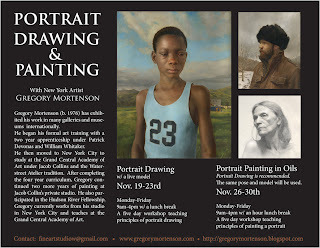 I just signed up to take a 5 day workshop with Gregory Mortenson in Vancouver, BC (well, Richmond actually but close enough). So excited to be taking such an amazing workshop and not have to travel to the states to do so! If you are interested sign up fast as there are only 10 spots and I am sure they will fill up quickly! You can register using the link above. I wish I could take the drawing portion as well but I used up ALL of my brownie points to take the 5 day painting portion. So I have my work cut out for me until the workshop to sharpen up my drawing skills!